The PrintPAD™ system eliminates the hassle of juggling a mobile printer and computer. It’s equipped with an integrated 101.6 mm (4 in) Honeywell MicroFlash™ 4te printer. Simply add a Honeywell CN3, CN4, CN3e, CN4e, CN51 or CN70/70e mobile computer to get the convenience of a portable thermal printer and mobile computer united in a compact, ergonomic unit. With the sleek PrintPAD Integrated Printing System, you’ll be able conveniently and securely carry your Honeywell mobile computer and communicate with the included printer in a single integrated package. Even charge both devices. The PrintPAD system provides a smart recharging solution by charging both the handheld unit and the printer simultaneously from a single AC or car adaptor, saving you money on unnecessary charging accessories. 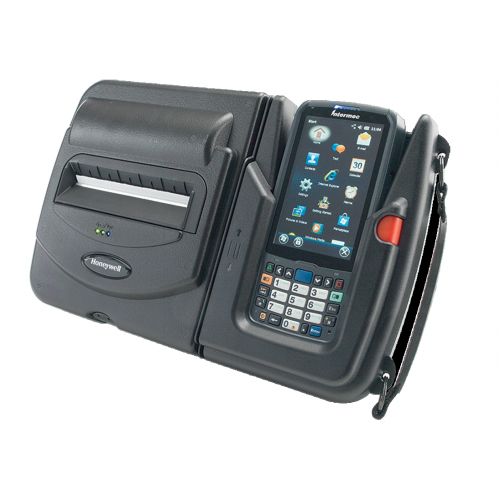 This innovative one-piece printer system combines an enhanced 101.6 mm (4 in) wide thermal printer, the Honeywell MicroFlash™ 4te, with an embedded communications charging cradle designed for use in a number of applications, including route accounting, direct store delivery and field service. Simply add a Honeywell CN3, CN4, CN3e, CN4e, CN51 or CN70/70e mobile computer for an integrated solution that helps you be more efficient and productive on the go. And to help ensure your wireless transactions are secure, the PrintPAD offers a broad range of security and encryption protocols that are compatible with today’s high-tech security requirements. Find out more about what you can accomplish with the PrintPAD Integrated Printing System and Honeywell workflow solutions. Contact us today.